What causes allergies during sleep? Allergies can be a real disturbance in the nostrils. If you have ever suffered from allergies, you know you spend a significant amount of time just trying to avoid catching it again. Your own home is supposed to be a sanctuary against allergies, you only imagine of having to deal with allergies outside, at restaurants, and at the homes of friends and family. But that may not always be the case. Within the walls of your home, there is often a multitude of allergens. It is inevitable that you find ways to eliminate the occurrence of allergies if you want to breathe easier, sleep better and live a happy life. Your fight against allergies start right in your bedroom and, in particular, your mattress. Natures Novel Mattress is rated the best overall because every component is a natural starting from the top cover to the down button. 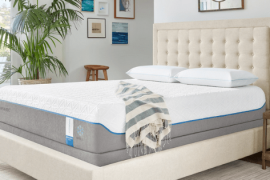 The wool cover is soft to touch, the Talalay mattress provides a natural mold and solid support, and is engineered by science to achieve an all-around healthy mattress and environment. While it has every one of these features, it’s also a good choice for its firm support and has over 2000 positive reviews, coupled with lifetime warranty and 100-night trial period. That’s why it is selected the best overall. Natural wool cover is good for both hot and cold weather. It cools you in hot weather and warms you in cold weather. Wool is also not allergenic, is flexible and very durable. According to the University of Sydney research, wool sleeping apparel and bedding increases total sleep time, promotes sleep onset and improves sleep efficiency. To complement the natural wool, natural cotton is added to produce a luxury soft feel to the cover. The body is made from 100% natural Talalay latex, which molds perfectly to the shape of a sleeper’s body. Natural latex is also hypoallergenic, eco-friendly, and extremely durable. Talalay latex is known for a cool and refreshing sleep as it is naturally breathable. The source of Talalay latex is from rubber trees that are not harmed in the process, making it completely renewable. Talalay cells are 50% larger and do not trap heat. This produces a temperature neutral environment that doesn’t disturb a person’s sleep. Talalay is ideal for people prone to allergies as it is naturally mold, mildew and dust mite resistant. It is also intrinsically antimicrobial, preventing bacterial and fungi pile up. 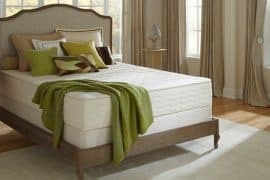 The cooling then heating process of the Talalay produces a pure latex whose cells are evenly distributed, which gives the latex better pressure relief and longevity. Natures Novel latex mattress is Oeko-Tex certified as Class I which is the highest rating possible. This certification signifies the mattress is free from harmful substances and is even safe for babies. The mattress doesn’t smell, you may notice the ‘’new bed smell’’ of the latex when it first arrives but no harmful gases that will irritate you. The Class I Oeko-Tex standard is the highest a mattress can get. Class I means that the product is safe even for babies and toddlers. This means the mattress is made without banned ozone depleters, phthalates, Mercury, lead, heavy metals, formaldehyde or any other harmful chemical. – Are looking for a responsive feel that is more “sleep on” than “sleep in” feel. – Are looking for a good value as this bed has 12 inches and is the least expensive on the list and comes with a lifetime warranty. – Share the bed with their kids as this bed is certified to be safe for babies. 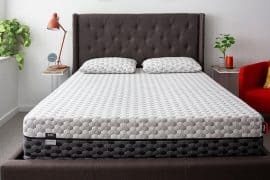 Nest Bedding Latex Mattress with topper soft is a good soft mattress that offers a healthy sleep environment as well, besides being one of the ideal mattresses for allergy sufferers. It is a natural latex mattress and feels comfortable which is partly attributed to its enhanced support. It can be blended with organic cotton fabrics and Joma wool to produce a cool and comfortable sleep environment for allergen sufferers. This mattress is designed to achieve neutral spine support while providing a pressure-free sleep surface. It is ideal for side sleepers because of the added Comfort Layer Talalay Topper. 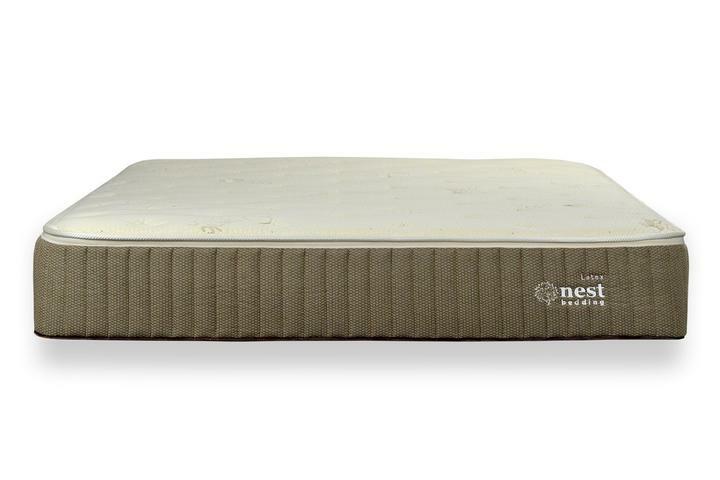 Nest Bedding Latex Mattress with topper soft without, is a soft to medium firmness mattress. Below it has two layers, a 6-inch base layer of firm Dunlop latex and on top of that a softer 3-inch layer of Dunlop latex. It is a latex mattress, so it has more bounce than an all-foam mattress. 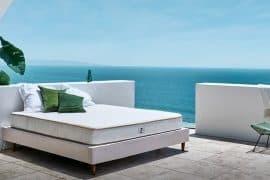 The topper is a piece of natural latex foam added on top of the existing mattress to improve support or alter firmness. As mentioned, it is natural latex made from the Talalay method involving pouring natural liquid latex into a mold to create the final foam. 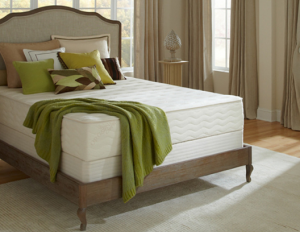 The result is a softer, bouncier latex foam coming from the Talalay process. 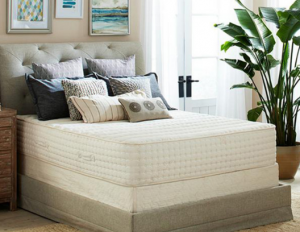 Talalay latex is ideally suited to a variety of firmness levels and has a consistent feel. 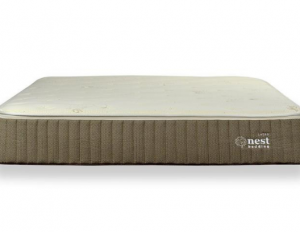 Nest Bedding Latex Mattress with Soft topper has many benefits to different types of sleepers. The mattress is soft, but the topper provides additional support, adjust firmness, or enhance airflow and prevent excessive heat retention. A firm latex topper can also help for heavy sleepers who find themselves sinking too deep into their current mattress. The top foam adds plushness and perfectly contours your body, allowing you to sink into the sleep surface. 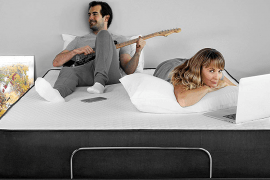 The mattress offers weight distribution with a blend of responsiveness and extensive support. It maintains a healthy spinal alignment and relieves pressure on your aching joints. – Sleep on their side mostly as this bed offers good pressure relief. – Prefer a softer feel that is also responsive with not too much sink in. 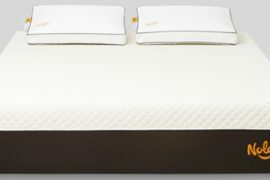 Plush Beds Botanic Bliss 12’’ mattress even though pricy has an organic Dunlop latex certification. Natural latex is as good, but this is a choice for those looking for a mattress with an organic certification. The cotton cover is organic and soft knitted offering unrestricted airflow and moisture absorption that keeps you sleeping cool and dry which also helps fight allergens. It is certified organic; a guarantee it was grown sustainably without any dangerous pesticides or herbicides, which is another plus for allergen sufferers. Certified organic wool in a latex mattress providing exceptional soothing support, breathes naturally and helps your body maintain a well-regulated cool and comfortable temperature throughout the night. Has layers of organic Dunlop latex from Arpico unique calibrated to a different firmness for a perfect precision level of softness and support. Plush beds Botanical Bliss 12’’ mattress buoyancy feeling gently cradles the body pressure points to help relieve aches and pains and promote deep sleep. Organic Dunlop latex is antimicrobial, mold and mildew resistant, meaning less sneezing and wheezing for allergy sufferers. It is also dust mite resistant, cutting down on the number one source indoor allergens causes. Plush beds has no off-putting smells or irritants, and no toxins which is another plus for allergen sufferers. Toxins found in mattresses can make you feel and look unhealthy. For example, exposure to mercury present in chemical adhesives can lead to headaches, mood swings, numbness, muscle weakness and difficulty in breathing. Oeke-Tex certification is a guarantee your new mattress is made of the highest quality hypoallergic materials available. Means your mattress is not emitting harmful chemicals into your home, thus a cleaner air and better sleep. – Are looking for a mattress with organic certification. Plush Beds 12’’ Luxury Bliss is a hybrid of organic latex and motion-isolating coils which keep your spine in a natural position. This mattress is ideal for side sleepers as well as good for allergy sufferers. The cover is a stretch of organic cotton, not woven, to provide a soft sleep surface. The encased coils provide unique comfort so as to eliminate painful pressure, constant tossing and turning, and restless, uncontended sleep. The coils are fabric incased and respond individually to pressure arising from every inch of a person’s body. That is why you feel the effect of superior support, minimal motion transfer and better, buoyant sleep experience. For improved airflow, the fabric encased coils have an open arrangement, providing a cooler sleeping experience. This goes a long way in fighting allergies as the improved air circulation keeps bacteria and irritating mold away. Plush beds 12’’ Luxury Bliss mattress features single-origin latex that is breathable, is naturally antimicrobial which prevents irritating mildew, mold, and bacterial growth, keeping the air you breathe clean and pure. There is no off-putting smell or irritants, which is another plus for allergy sufferers. Means no toxic emissions, harmful chemicals or volatile compounds while you sleep. Guarantees the mattress is made of the highest quality hypoallergenic materials available. Guarantees the latex and cotton materials used have met the most stringent organic standards for pure, clean sleep. – Are looking for an innerspring mattress feel that still uses latex. – Are looking for a mattress with a good organic cotton cover. Zenhaven mattress is good for allergy sufferers because of its pure tree tapped latex. The natural latex resists mold and microbes. 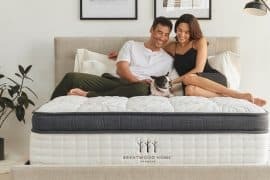 This mattress is unique in its 2-in-1 comfort innovation which is two different comfort levels in a single mattress—the luxury plush and gentle firm. The luxury plush comfort range conforms and supports a person’s body effortlessly while still maintains a luxurious, plush feel. The gentle firm range is 18% firmer than luxury plush and is for those who are looking for a slightly firmer experience. 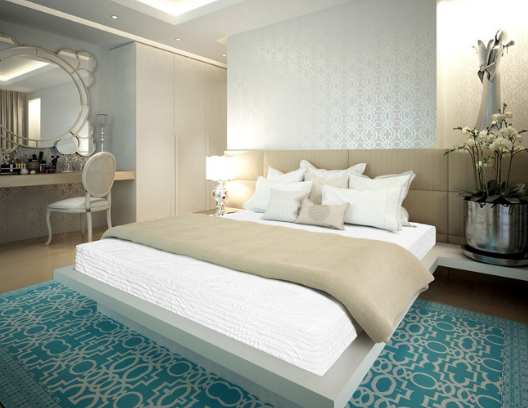 Zenhaven mattress boast of 5-zone latex comfort whereby size and distribution of pinholes are varied during the Talalay process to create a seamless mattress layer with five distinct zones of density. This provides firm support beneath the torso and shoulders and subtle support elsewhere. The overall effect is better spinal alignment and an almost pressure-free support. 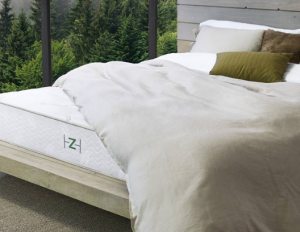 Zenhaven chose to go with the resilient Talalay latex not Dunlop latex for a supple buoyant feel, and it offers an elevating sensation, durability, and breathability which is a plus for allergen sufferers. Just to summarize, Zenhaven mattress is one of the ideal mattresses for allergy sufferers because it is naturally hypoallergenic and resistant to mold, dust mites, and microbes. It contains no organic compounds or other harmful substances found in chemical-based bed foams. The latex used has an open cell structure allowing air to circulate freely, countering body heat and providing a cool, comfortable environment which is a plus for allergen sufferers. – Looking for a mattress that is double sided and latex. – Prefer a mattress with a natural wool cover to regulate body temperature. – Looking for a mattress that offers two different firmness options. – What to look for in a mattress if you have allergies? Natural latex or pure latex mattresses are made entirely of organic materials, so they’re naturally hypoallergenic and resistant to dust mites, mold, and mildew. Your bed might feel like a sanctuary, but it also can be a haven for dust mites. Dust mites are tiny eight-legged creatures you can’t see without a microscope. They are colorless and might be crawling through your mattress like invisible spiders. We sleep in the same place every night, and we are constantly shedding skin cells, so this skin cells accumulate in our mattresses. Hair and body oil also rub off into our bedding. All this organic material to dust mites is delicious food. Throughout the day and night, they creep through the bedding munching on what they find. As they eat, they also produce waste which becomes embedded in the mattress, where you touch and breathe it in. Your body responds noticing that insect waste should not be in your system by triggering an immune response. Your skin might itch, and respiratory tract shows the symptoms associated with environmental irritants. If you live in a moisture-rich environment or you’re a sweaty sleeper, it could lead to the growth of bountiful amounts of mold and mildew, both of which cause allergies and respiratory issues. Mold and mildew are not restricted to damp environments, but they are also airborne. Most mattresses have poor ventilation, and airflow is further restricted by pillows, sheets, and blankets. If the air inside your mattress is seldom distributed, it provides a safe environment for mold and mildew spores to breathe. Spores can get in your nose and irritate existing conditions. Your mattress may be full of materials that causes or harbor allergens. Change to a hypoallergenic mattress that’s allergen-free. Go for a mattress that’s made of natural materials and free of chemicals that can irritate, for example, latex material. Hypoallergenic mattresses create an unfriendly environment for mold, mildew, allergens, and dust mites. They have an open cell structure, and extensive washing process eliminates all sorts of allergic reaction risks. Hypoallergenic materials such as latex are one of the options to try. No doubt you do everything you can to keep your home clean. Despite all your best efforts, your mattress is probably still crawling with invisible bacteria. As much as you would wish to throw your mattress into the washing machine, it just is not possible. So, what’s the solution for keeping your bed bacterial free or achieving an antibacterial mattress? An antibacterial or antimicrobial mattress is made of materials that strongly prevent the growth of bacteria and designed to provide you with a cleaner, healthier sleep. Bacteria grows everywhere, and it can grow in your mattress. Everything you touch throughout the day: door handles, sink faucets, bathroom stalls, all crawl with bacteria. You bring those germs into bed with you. The warmth your body provides while you sleep promote the environment for bacteria to thrive and spread. Keep out an eye for natural antimicrobial materials in mattresses, for example, pure natural latex or Talalay latex’s unique properties make it inherently antimicrobial, preventing the growth of bacteria. Although most of the big foam mattresses are made from petroleum-based polyurethane, they are only bad if paired with harmful chemicals like formaldehyde. Most mattresses have poly foam in them but are CertiPUR-US certified. This basically means mattresses with poly foam are not harmful if they have this certification. Also some companies claim they are CertiPUR-US certified but when you go to the CertiPUR-US website, you don’t find their name. Be careful of these not so reputable companies. Memory foam is viscos elastic polyurethane foam. So just like poly foam, Harm arises only if there is presence of chemicals like formaldehyde. As a matter of fact, most recommended mattresses have poly foam in them without any bad chemicals as they have been CertiPUR-US certified. It is recommended that a mattress be button-tufted by hand to anchor the layers of the mattress together. No chemical adhesives, which are commonly associated with off-gassing, should be used between the comfort layers of the mattress. This radical minimal approach significantly reduces your chemical exposure and promotes healthier indoor air quality. One of the ways in keeping your allergens under control is by employing cotton cover in your mattress. It is a hypoallergenic material cover for pillows, mattresses and duvets meant to protect your bed from allergy-causing dust mites and other allergens. Depending on the severity of your symptoms, you might consider cotton hypoallergenic sheets, pillows and even mattresses. 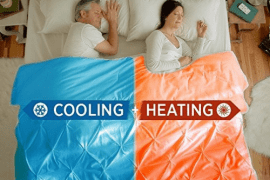 The mattress cover should be breathable and made from a sustainable material that should reduce heat retention and potential allergens that can bring about respiratory problems. The cover is usually CertiPUR-US certified and also resistant to molds and other potential triggers. The cover material should be made from natural wool or cotton, which adds up to optimum breathability and discourages the growth of allergens that might trigger your respiratory system. The cover can also be of bamboo as it is resistant to allergens and gives the bed an attractive finish. A mattress cover creates a barrier between you and the mites in the mattress. Without access to their food source, they’ll die. Another benefit of a hypoallergenic cover is that if you’re allergic to any part of your mattress, the cover shields you from the material that could cause a reaction. The mattress cover should have high permeability, be easily washable and have a special zipper so that mites cannot gain access to the mattress. It makes sense to protect the mattress with a protective cover that can easily be washed in the cover, to prevent stains. The cover should be washed in a washing machine every six to eight weeks. A wash at 60 degrees Celsius eliminates the mites entirely and also the allergens. The woven fabrics through more pleasant texture-wise to cover mattresses, they are vulnerable to dust mites. It gives the mites some space to live in. A waterproof mattress cover or encasement will prevent moisture from ruining your mattress. Furthermore, it extends the life of your mattress, preventing stains and dust mites. Majority of mattresses use unhealthy fire retardants due to its cost efficiency. Instead, a better quality, 100% natural fire retardant should be incorporated in mattresses. Hazardous fire retardants include harmful chemicals such as boric acid, antimony, and decabromodiphenyl oxide, a possible carcinogen which causes hair and memory loss. These chemicals pass through mattress covers and are absorbed through the skin. Chronic exposure to these chemicals leads to them accumulating in the body and present themselves in the bloodstream, breast milk, and umbilical cord blood. Wool is one of the natural fire retardants that should be used in mattresses. The wool is natural, chemical free and pesticide free. It should not be treated with harsh chemicals or harmful pesticides. Wool is an ideal, natural, non-chemical fire retardant. Wool’s strong fibers can withstand years of compact while sleeping because of its strong ventilation wicking ability. Wool repels mildew and absorbs moisture from the body while sleeping and moisture from the air. This feature shows why adding wool to a mattress adds a luxurious feel of comfort and a chemical-free experience with wool’s natural fire-retardant properties. You should be concerned about the chemicals in your mattress because of the health risks chemicals poses to a person’s life. Manufacturers of organic mattresses suggest that their products are safer. 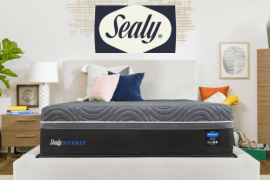 But determining whether a mattress is partially or completely chemical-free can be a challenge because there are so many different labels that make various claims. The term natural on a mattress is meaningless, with no certifications or standards behind it. A mattress labeled organic may have only some materials that are actually certified organic. 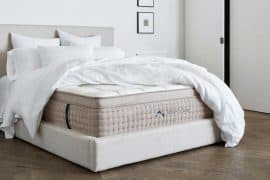 For a mattress to qualify for the USDA Organic seal, it needs at least 95% certified organic materials and to be processed without potentially harmful chemicals. Some mattress brands claims and logos are backed by strong, extensive standards that aim to minimize environmental impacts, from the farms that grow cotton to the factories that make the mattress. Others cover one aspect, like testing for indoor air emissions for a particular set of chemicals. 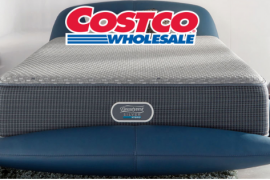 Before you buy a new mattress, check mattress ratings, buying guide and reviews for helpful information on shopping tips, reviews of many brands, plus ratings of retailers and brands to help you choose a mattress that is genuinely certified to be healthy. As an example, if a mattress is class 1 of OEKO-TEX certified, then this basically means that this mattress is tested and certified by a third party to be healthy even for kids under 3 years of age. These kinds of certifications is what you’re looking for. – How can allergies affect your health? Allergies are the result of your immune system’s response to a substance, which can be mild, from coughing and a runny nose, to life-threatening reaction known as anaphylaxis. If you do have ongoing allergies and they are not taken care of effectively, it could weaken your immune system and make you more susceptible to viruses and other germs. This could lead to your uncontrolled allergies evolving into a sinus, ear, or an upper respiratory infection. Respiratory allergy symptoms can make it difficult to get a good night’s sleep. Here are simple tactics that can make a big difference. Take a shower right before bed it will wash away the pollen out of your hair and out of your body, making for a more pollen-free bed. Gravity plays a pivotal role here. Congestion has been always worse when you are lying down as there is no gravity, and the mucus just sits there. Prop up your head on a pillow; this can make a difference in some respiratory allergy symptoms at night. At certain times of the year, many people tend to open the windows and air out their homes or house. Unfortunately, doing this can attract the very thing that’s making you sneeze. If you tend to open the windows every time, try running a vacuum in your bedroom every night before going to sleep, and wash your sheets more frequently than usual. Your respiratory allergy symptoms could be triggered by pet dander, so keep them out of the bedroom. Dust mites are prone in the bedroom, where they can disrupt sleep by causing allergies. Use dust-mite-proof mattress cases and pillow to create a barrier between you and the dust mites. Wash your beddings once a week in hot water to kill dust mites and remove allergens. What kind of pillow and bedding do you recommend for allergy sufferers? Wool and cotton pillows are both naturally hypoallergenic and very healthy fibers as they allow for breathing fibers and natural wicking away from the body. Cotton pillows are softer than most wool pillows, but are preferred by those who like flat pillows as they compress fairly quickly. Latex pillow is inhospitable to dust mites and mold. They remain in perfect shape for years. Go for beddings with hypoallergenic fabrics, meaning they are woven tightly together to keep dust and other allergens from being able to work their way into the bed. Concentrated on natural latex beddings or hypoallergenic memory foam bedding. Conventional wisdom advocates changing your mattress once every 7 to 10 years. This number is dependent on how often you use the mattress and how well you care for it, but it’s a good rule of thumb for your primary bed’s lifecycle. You can use mattress protectors to reduce or eliminate dust mites in mattresses and in turn keep your mattress longer. Your mattress might be the issue that’s causing instances of bad sleep so the need to replace it. The 7 to 10 year period also depends on the mattress type, whether you sleep alone or with a partner, and how you sleep. Are Memory Foam Mattresses Also Good for Allergy Sufferers? Yes, both memory foam and latex mattresses showcase good hypoallergenic properties. However, latex is much better even if memory foam is good. Furthermore, you can use organic cotton or wool barrier to cover the mattress to avoid direct contact with the foam or latex. Similarly, you should employ hypoallergenic pillows for a complete allergy-free sleep. Spring mattresses are the least favorable for allergy sufferers because of their innerspring system. Their inner cavity system creates an incubator for dust mites where dust mite feces and dead skin cells accumulate. You will often find mold and mildew within the cavity of spring mattresses due to humidity caused by the transfer of body heat. Hybrids on the other hand that use pocked coil system are much better because of how pocketed the coils are. Natural latex mattress is the ideal mattress for allergy sufferers. It is termed hypoallergenic mattress because it inhibits the propagation of allergy affecting microorganisms like dust mites, fungus, and bacteria by preventing them from penetrating into the mattress, pillows or other objects. Avoid fluffy pillow-tops all the same as they create breeding grounds for dust mites and the dust mite feces to accumulate in. Mattress covers do help with allergies, so look for one that is hypoallergenic as well.